This astounding ring features 2 1/4ct in dazzling diamonds on the ring itself. A brilliant halo of pave diamond surround the center diamond, 2 marquis diamonds totaling over 1ct are surrounded in shimmering diamonds, plus additional pave diamonds lead down the shank. Even the center diamond basket is encrusted in brilliant pave diamonds. 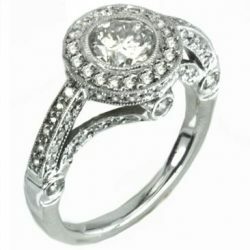 Centered is a striking 3ct round diamond for a total of over 5cts! A one of a kind custom ring! 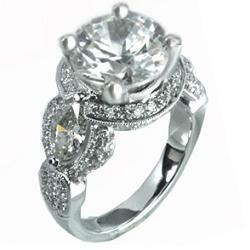 This ring excludes elegance with a halo of diamonds and a diamond encrusted shank. 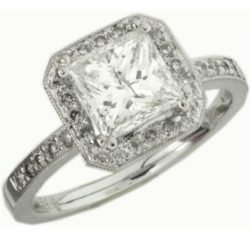 Featured atop is a quality 1ct princess cut center diamond. 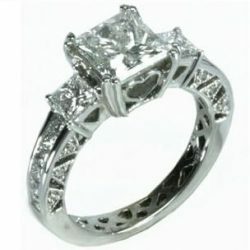 This ring also has a matching pave set diamond band. Please call to hand select the center diamond. 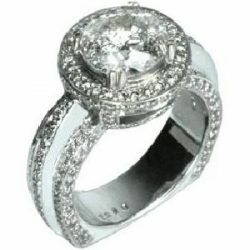 A designer style diamond ring in a solid white gold with shimmering pave diamonds around a 3/4ct round center stone. Additional pave diamonds lead down the shank. The side of the ring is impressive and enhances the sparkling diamonds also 3 individually, large bezel set diamonds on the side. 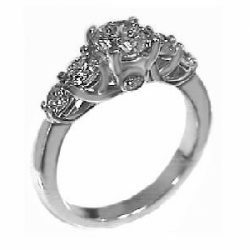 With a total of 1.5cts in diamonds this ring is sure to turn heads! Please call to hand select your center diamond. New contemporary three stone ring with pizzazz! 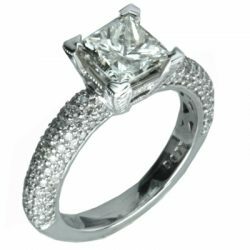 Gentle curved prongs hold three large princess cut diamonds. 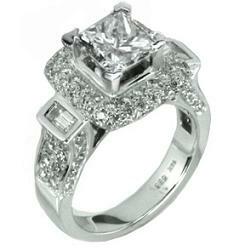 Centered is a 3/4ct radiating princess cut diamond. 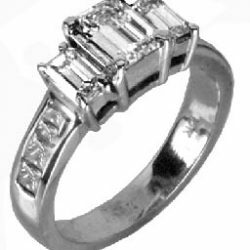 Each side boasts an already large princess cut with channel set diamonds. The side of this elegant ring portrays a shimmery pave set diamonds with a round surprise bezel set diamond. Give her a ring full of elegance and uniqueness. 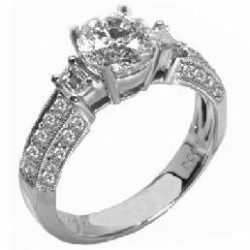 Solid white gold with 4 round diamonds in a contemporary style setting. 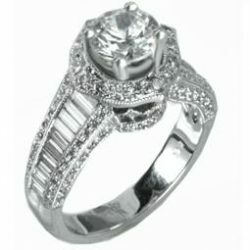 The sides are adorned with a round surprise diamond bezel set. 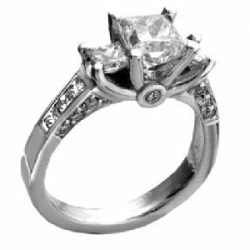 This ring includes a 3/4ct round center diamond. Please call to hand select your center diamond. Over 4ctt with round brilliant center with pave diamonds on the sides.